M25 Crash: Baby Boy Born In Traffic After Coach Overturns On Motorway. 41 people were left injured after a coach overturned on the M25 near Swanley in Kent. Three people with more serious injuries were taken to hospital, while 38 were treated for minor injuries. Seven children were among those hurt, South East Coast Ambulance Service said. The Princess Royal University Hospital in Orpington, Kent, was put on major incident alert, a spokesman said. It later said it was treating 23 people. It is not known if the baby was born to one of the injured parties. South East Coast Ambulance Service has confirmed it is treating 41 patients after a coach overturned on the M25. Lanes one and two at Junction Three anti-clockwise have been closed, as has the exit slip road, causing major delays. 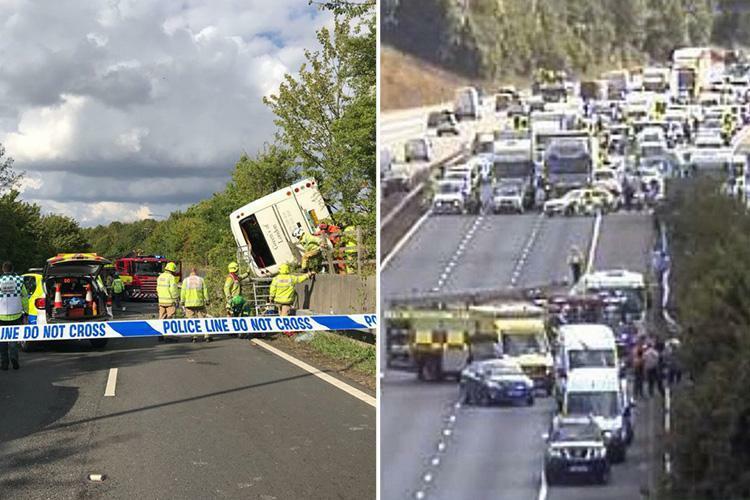 Police, ambulance and fire services were called to the scene at the M25 at Swanley just before 4pm. A statement from Kent Police said: “Kent Police was called at approximately 4pm on Monday August 13 to reports of a collision involving a coach on the anti-clockwise carriageway of the M25 near to junction three. “Officers are currently at the scene with South East Coast Ambulance Service and Kent Fire and Rescue Service. “The Junction Three slip road on the anti-clockwise carriageway and lanes one and two are currently closed.